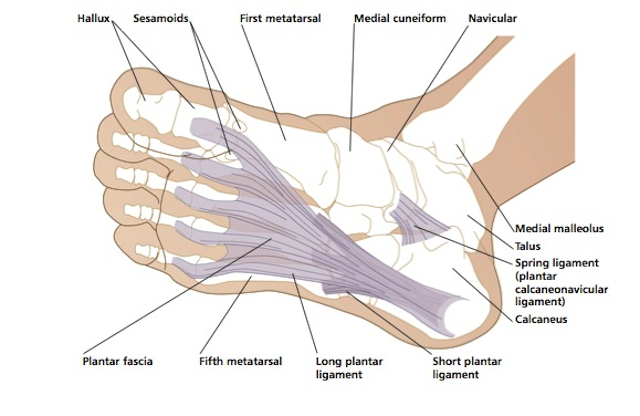 The foot has 26 small bones of various shapes, linked together by joint capsules, ligaments, tendons and muscles. There are several tiny floating bones called sesamoids around the foot, with two main ones under the ball of the big toe. These are held in place by tendons. There are small muscles within the foot called the intrinsics (lumbricals and interossei) and longer muscles which run between the lower leg and the foot, such as the anterior tibials on the front of the leg and the peroneals behind. The foot’s arteries and veins form curves, called plantar arches, along the edge of the fleshy part of the sole of the foot, near the outer side. They give off innumerable tiny branches to supply every part of the foot and toes. The foot has a rich nerve supply, and the nerves mainly follow the line of the foot’s longer bones, leading into the toes, and giving off branches to all the tissues along the way. Feet are very individual. Many variations appear within the basic structure. These can be differences in the bones or soft tissues. Your heel might be relatively narrow, your forefoot wide, and vice versa. If the second toe is longer than the big toe (hallux), it is called a “Morton’s foot”. Toes can be extra long or short, stiff, pliable or dextrous. They can be pulled into the bent position of hammer toes by tight tendons over the top of the foot. Tendon and muscle imbalance can cause the big toe to be pulled towards or even over the second toe in a bunion (hallux valgus). Again because of tendon and muscle imbalance, the inner arch, the raised part between the big toe and the heel, can be unusually high in a high-arched foot, or “dropped” in a so-called flat foot. The foot is arranged so that it can perform all the complex tasks we take for granted when we are upright. Its many joints make the foot very adaptable on uneven surfaces and allow for varied movements. The foot supports our bodyweight when we stand. It propels us forward in walking and running, or upward in jumping. It enables us to change direction, in walking and running, it allows us to pivot in dancing or sports like tennis, squash and badminton. It absorbs the shock when the foot touches the ground during walking, running, skipping or leaping. The foot has to withstand variable shocks in sports like football and contact martial arts. With training and practice, the foot can also adapt to performing unexpectedly delicate tasks, normally performed by the hand, like drawing and painting. In the normal way, weight is transmitted from the outer edge of the heel to the ball of the foot behind the big toe when you walk or run. Hardened skin under your foot reflects your pattern of weightbearing, so most often there is a calloused area under the ball of the foot. In a “Morton’s foot” the calloused weightbearing pad is often under the head of the second toe, as the second toe seems to take on the function of the big toe. Many people walk and run entirely on the outer edges of the feet, over-supinating. Tightness in the tibialis anterior can be a factor in this, and the mechanics of the knees and hips can play a part. If you tend to roll your feet inwards as you walk or run, this is over-pronation. It’s most often caused by weakness and imbalance in the tibialis anterior and the peroneal tendons which should support the arch of the foot, but poor mechanics in the rest of the legs right up to the hips can contribute. When all is well, you don’t have to think about how the foot works. it has a rich nerve supply. Proprioceptive and sensory nerves regulate information about where the foot is in space, or what kind of surface it is in contact with, and from these messages the motor nerves stimulate the foot and leg muscles to make the innumerable adaptations needed for staying upright, shock absorption and propulsion. The foot is very vulnerable to harm. Any injury or painful condition disrupts its nerve function, and immediately causes problems weightbearing. Apart from localized injuries caused by trauma or overuse/abuse, it can be affected by inflammatory joint conditions such as gout or ankylosing spondylitis, by circulatory and neurological diseases, and by referred pain from the hip or back regions. Unsuitable or ill-fitting shoes can cause untold harm, especially during children’s and teenagers’ growth years.